The factory is making some colour swatches to tone down the colour and add a bit of grey, as much as I like it it is a bit bright. John, it'll be a winner with your open minded approach & dedication to get it right. Look back at where it all started & the journey to date. John, in an effort to get this right, I have done some digging and came up with this on google. 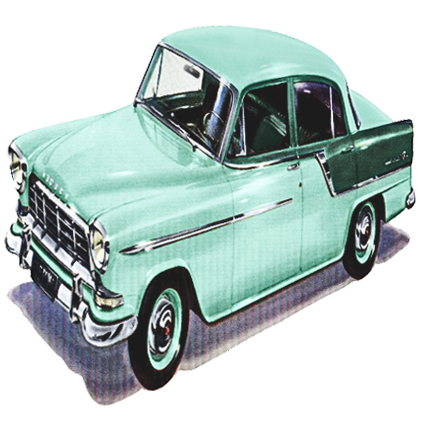 1956 colour codes-ford cross reference. Looked into the site and bingo!! All the paints, codes & samples for each year and cars trucks etc. 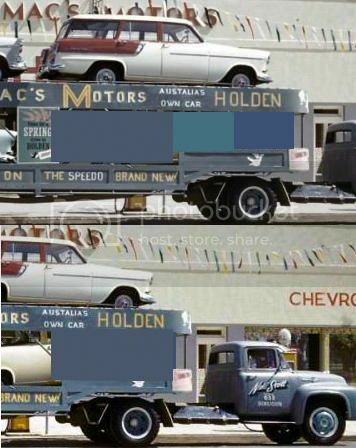 Check out 1958 ford truck colours, there are a couple that look very close to the paint in the photos. I think one of these colours is the right one. is this the one Jim? Or Gulfstream, they both look pretty close. Did you click on the enlarge enlarge tab? Gives a better view. Showing both on the original photo & the colour boosted version. I guess it's also a matter of what we are used to seeing too, the photo we saw first is what we naturally think is correct. I can try a few more if you like. We can match it on the screen at least if the formula is of any use. I must admit I like the gulf stream colour. The azure colour is somewhat close to what John has got though isn't it? Went back to 53-54, glacier blue looks the goods. Maybe we should try the Scott's and see if they have a build year for the truck and or details on the truck? It would be great to have it as close as possible to the original. Glacier blue added. On my screen the Air Force blue looks closer than any, but that's not always going to be that case on other screens. I thought the build year was nailed from what you found earlier, but Scotts may just have something more as you say. Are we looking at this the right way? I'm thinking it could easily be GMH colours with the signage & all done at the same time. Perhaps the wheels were the same as the sun visor & front sections but the Marlin Blue looks good on the bumper. Granite Grey & Volcanic Grey are almost identical. Just a few years apart with the slightest variation. The transporter is looking great. I agree, the colour needs to be darker and greyer, but it looks like you are working in that direction. I don't think there is a need to get 100%, so long as it is a close representation. As mentioned, faded photos and monitor settings will change the colour anyway. 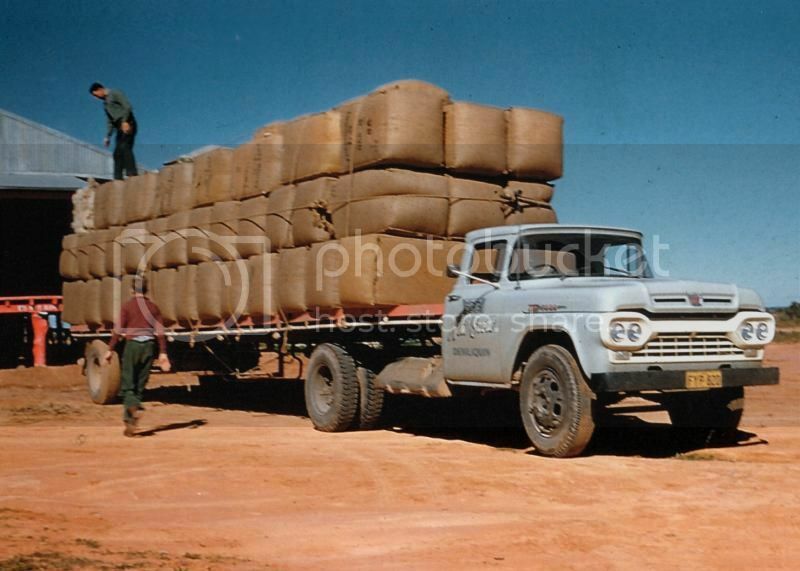 Just wondering about the white patches at the front of the trailer. To me they appear to be paper residue from posters that were glued to the truck at some stage and removed or blew off whilst driving. Similar to those remaining. If I am correct, I think these could be deleted to make a cleaner model. Can't see the need for them to remain for the sake of accuracy. I agree Alex, we now have a great representation of a transporter that transported FC's. Those patches certainly look like poster residue and don't need to be recreated as in 1:43 scale it would be too small to read. I vote to leave them off as well. 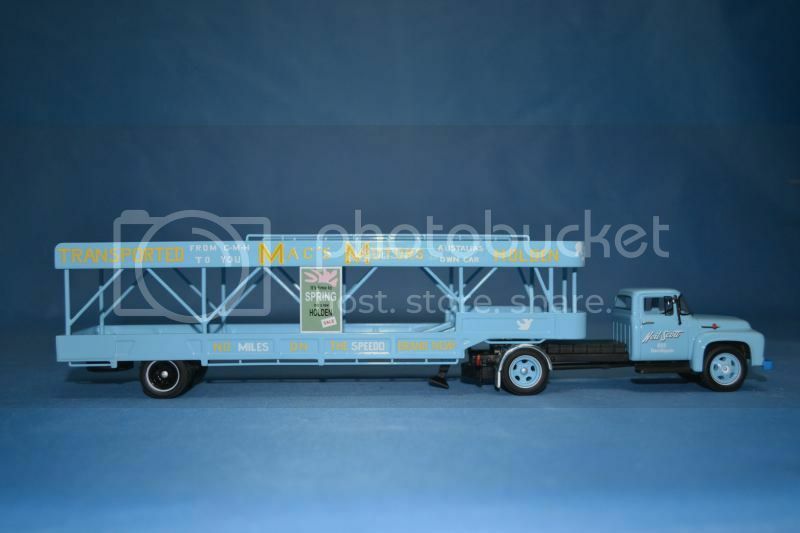 Ok good input guys but now to muck with your heads a bit more, here are some shots of other Neil Scott trucks. This was his colour it would appear at one stage possibly after the 56 F600.Here is a comment from a guy that dos some research for me. The factory is sending some more colour samples to me which I will post. Great work guys we will get it right. Looks good but it might be a little too bright, but it is hard to tell from a photo with a flash as well. I attached a couple of pictures and I think the colour should be like the trailer colours on them. As I say again it is hard to tell if the colour is right with a flash. 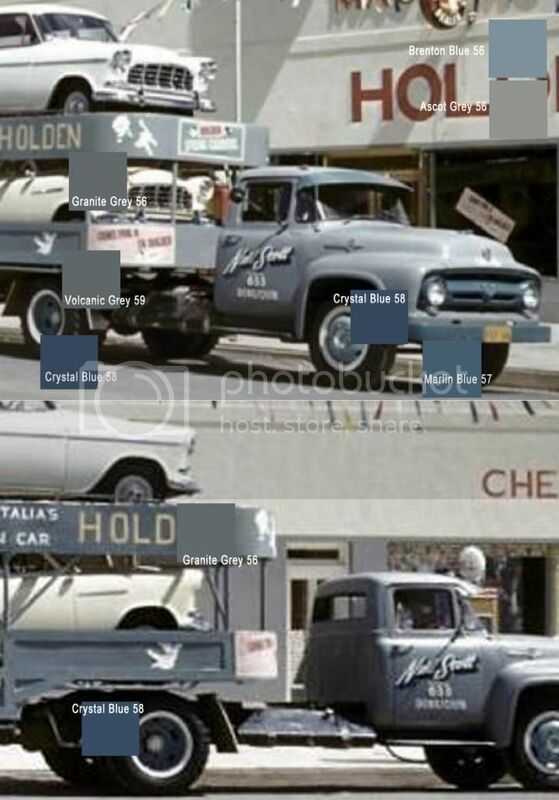 Does the person who said it should be grey actually have a picture of the truck at all and not just the old ones we already have? 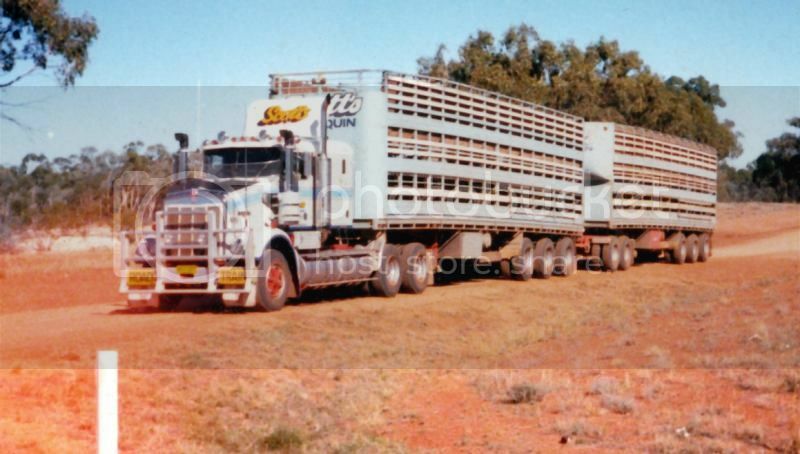 Maybe explain to them that the colours are off on the photos and put these pictures up of his other trucks. Did you ever think we would have this much discussion about a Ford. I have found out a bit more, I think a 1956 F600 may be painted Hobart Grey or that what the later trucks were painted. Not much more that I can tell you at this stage. What a difference in the newly added shots. The one with the wool load looks as though it hasn't suffered from too much colour shift. 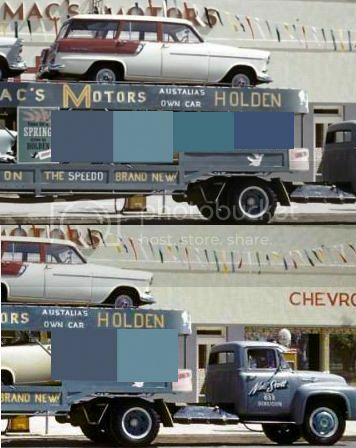 If it's the same paint, we're just used to looking at the photos posted here carrying Holdens. It is funny that we are spending this much time on a Ford, but I think we all agree that this one is worth the effort. Did some more checks, it would appear that the grey was deleted in the sixties, but 56 has Platiunm Grey so maybe that's the one.